PLEASE NOTE: This itinerary is for guidance only. Programs may vary depending on local ice and weather conditions, the availability of landing sites and opportunities to see wildlife. 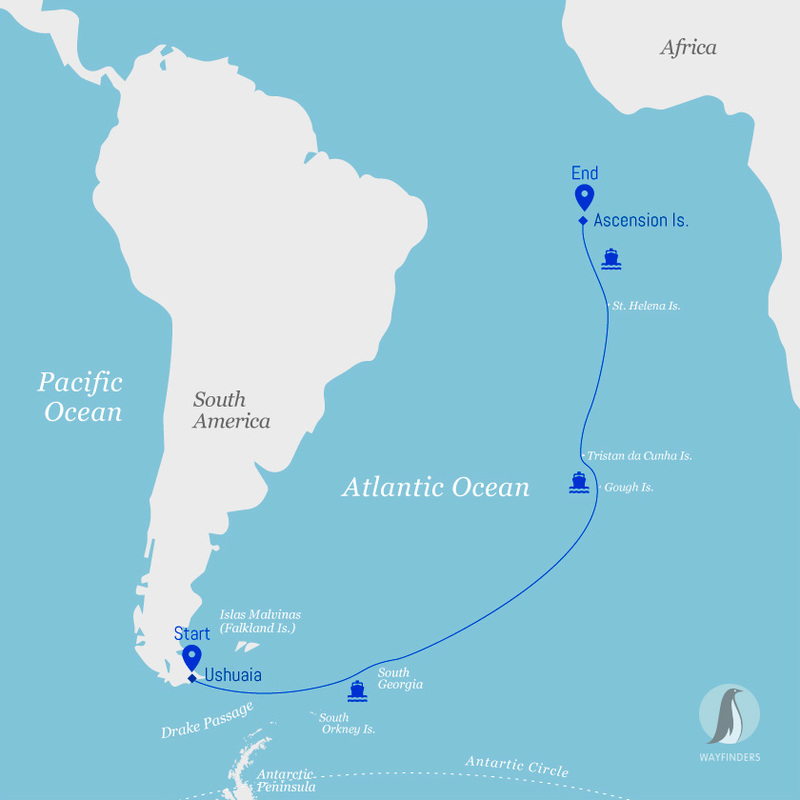 Since we began our Atlantic Odyssey’s (1998) we failed during 30% of the voyages to make landings in the Tristan da Cunha archipelago, due to adverse weather. The final itinerary will be determined by the Expedition Leader on board. Flexibility is paramount for expedition cruises. Average cruising speed for m/v Plancius is 10,5 knots. Recently, all flights to and from Ascension have been cancelled. Therefore, you should also book PLA36-18 in order to catch your outbound flight from Praia, Cape Verde. Cruise fares of voyage PLA36-18 are offered with 20% discount. During these two days we sail across the Drake Passage. When we cross the Antarctic Convergence, we arrive in the circum-Antarctic up welling zone. In this area we may see Wandering Albatrosses, Grey Headed Albatrosses, Blackbrowed Albatrosses, Light- mantled Albatrosses, Cape Petrels, Southern Fulmars, Wilson’s Storm Petrels, Blue Petrels and Antarctic Petrels. 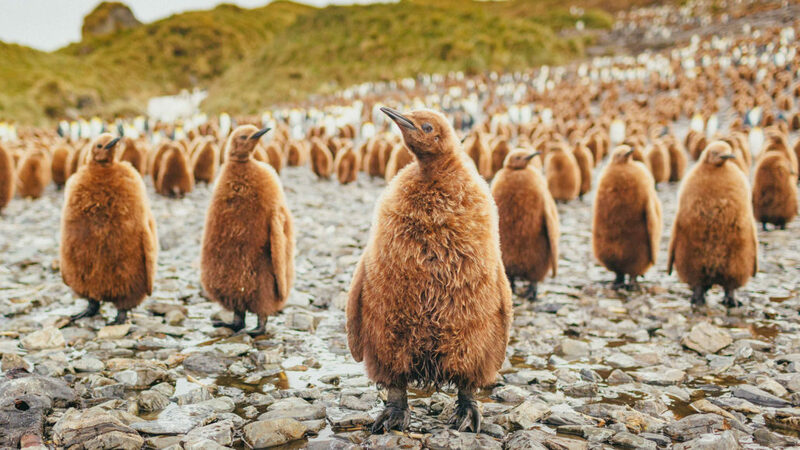 We aim to visit some of the major King penguin rookeries in the World. The late season offers an outstanding chance to see the King penguins on eggs and with small chicks. The rookeries are packed at this time of year and the traffic to and from the beach is astounding. Salisbury Plain offers this scenario in mind boggling quantity. We will see the huge King penguin colony along with Elephant seals and endless numbers of fur seal pups playing in the surf. On Prion Island in the Bay of Isles we can see breeding Wandering Albatrosses. We will also find time to visit the old whaling settlement in Grytviken, where now the penguins walk through the streets. Grytviken is home to a small, but highly informative museum and also offers a chance to visit the graves of Sir Ernest Shackleton who is buried here alongside his trusted friend and second in command Frank Wild. We will attempt to land Gold Harbour and St Andrews Bay with stunningly beautiful scenery and a wildlife density second to none. King penguins are truly Kings here! In the Westerlies we have often have a pleasant tailwind. On both sides of the Antarctic Convergence, we observe many species and great numbers of Antarctic and sub-Antarctic seabirds. Today we plan to approach the unique Gough Island for zodiac cruising in Quest Bay. As always weather permitting. Here we can see the Northern Rockhopper Penguins, and Sub-Antarctic Fur Seals. In previous years we managed to circumnavigate all but four miles of the 33 mile circumference of the island in the ship, saw spectacular scenery and an unprecedented abundance of wildlife. We felt very privileged to be among the few visitors who have been able to experience Gough Island and in particular, to see it at such close quarters. We hope to be lucky to repeat this unique experience with you. In the Tristan da Cunha archipelago we plan to call on the settlement at the west side of the main island. We will also try to make landings at Nightingale Island and Inaccessible Island with millions of seabirds ranging from Yellownosed Albatrosses to Brown Noddies. We allow one day in reserve for bad weather. Please note that we will try and approach for landings, however due to the weather conditions this is not always possible.Since we began our Atlantic Odyssey’s (1998) we failed during 35% of the voyages to make landings in the Tristan da Cunha archipelago, due to adverse weather. We now enter sub-tropical waters with their own species of seabirds and dolphins. St. Helena has a good anchorage and landing site at Jamestown. On this island, we will have opportunity to enjoy local culture, pleasant climate, and endemic plants and birds. We will visit Longwood House, the place where Napoleon lived and died in exile. There will be opportunities to explore the Island on your own and for snorkelling in the shallow surf where we can find a multitude of tropical and sub-tropical fish species. At sea along the mid-Atlantic Ridge. (April 23 & 24) – Here we encounter a dry volcanic island with a moist and richly vegetated top. The Sooty Tern (wide-awake) colony sometimes consists of more than 1 million breeding pairs. We will try to make a trip to the moist summit of Ascension Island and make visit the Wide-awake colony. In the evening we hope to go ashore to see the egg laying Green turtles on the beach. In the evening the vessel will depart from Ascension Island.